At the Kitchen Doctor Ltd we provide an excellent all-round service to all our customers from the start to the finished project. We will always keep customers up to date as the project progresses so any change can be made at an early stage to avoid any stress and complications. 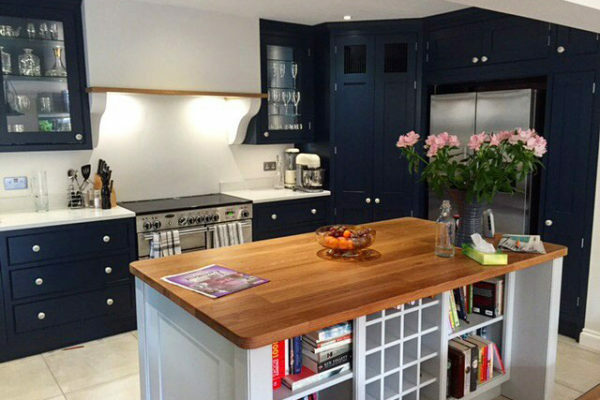 Our bespoke joinery specialists can undertake all types of bespoke joinery projects from small (hanging doors) to the larger projects (loft conversions, bespoke fitted cabinets, bespoke furniture). Specializing in handmade cabinets such as alcove units, bookcases, home offices and home cinema, we can also manufacture all types of joinery, doors, windows, frames, staircase and shop facias and facades. We are happy to renew spindles, handrail newel posts and flooring (solid engineered flooring or laminated). We can use Blumotion soft closer runner and hinges or the traditional type, depending on your requirements. All of our bespoke craftsmanship can be finished with any type of finish such as traditional French polish, sprayed lacquer and sprayed and hand painted traditional finish. We are happy to revisit our work after a 3 month period, free of charge, to complete any snagging that may be required. We pride themselves on their friendly and helpful nature and we are happy to help in any way we can. You will find us very clean and tidy workers; we are both family men, so we are well trained in all aspects of domestic peace. Please check out our photo gallery for samples of our work. We are always happy to speak to you, however small the query may be and help in any way. We also offer free home visits and quotations. Please contact the Kitchen Doctor on 01689 850000 or alternatively use our contact form, we will be happy to discuss your individual requirements.